(Natural News) A study by North South University researchers in Bangladesh shows that the Java plum (Syzygium cumini), a plant native to the Indian subcontinent and Southeast Asia, can effectively prevent cell damage caused by oxidative stress, as well as reduce the likelihood of inflammation and fibrosis in the liver. The study, published in BMC Complementary and Alternative Medicine, also suggests that the seed powder from the plant can improve the body’s reaction to insulin resistance and regulate abnormal cholesterol levels – which can be useful in people with obesity. Researchers used rats that were fed a high-carbohydrate high-fat (HCHF) diet – mainly composed of chow food, sugar, beef tallow, and condensed milk – for the study. The rats were grouped, with some given dried and powdered Java plum seeds in their diet. Some of the powder was also sampled to evaluate its phenolic content. Blood glucose, as well as weight and food intake, was measured every day. At the end of the experiment, blood samples and internal organs (i.e., heart, kidney, spleen, and liver) were harvested for tissue analysis. In particular, oxidation markers, lipid accumulation, and antioxidant activity were all measured. Researchers found that an HCHF diet can not only lead to obesity, but it can also increase the risk of having metabolic syndromes which can lead to diabetes and cardiovascular disease. The rats also showed increased body weight gain, fat deposits in the abdominal region, increased insulin resistance, and abnormally high lipid levels, as well as increased oxidative stress in the liver. Rats that were given the Java plum powder, however, improved glucose tolerance to insulin – which researchers believe is due to the presence of gallic acid and ellagic acid which help stabilize blood glucose and insulin levels. In the study, they also looked at the ability of the seed powder to inhibit amylase enzymes from breaking down ingested sugar into simple carbohydrates. Researchers also found a similar trend in antioxidant activity in rats that were given Java plum powder. 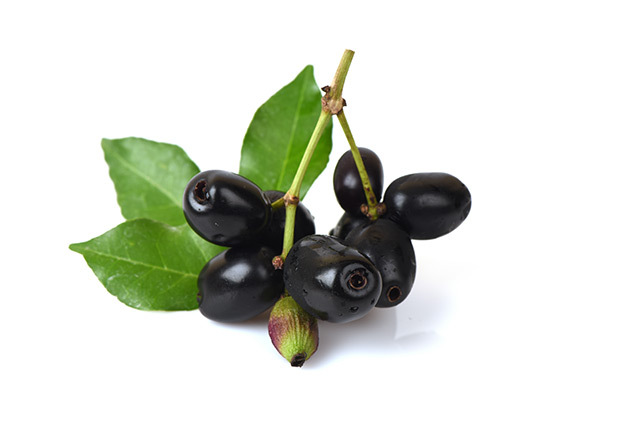 “Syzygium cumini seed powder prevented the rise of plasma oxidative stress markers and restored the antioxidant enzyme activities,” they wrote in their study. The antioxidant activity of the seed powder was also seen in the liver, where it reduced the biomarkers for the infiltration of inflammatory cells, fibrosis, and iron overload. It also prevented the rise of total cholesterol and triglyceride levels. “The present study, for the first time, shows the ameliorative potential of Syzygium cumini seed powder on [high-fat diet] induced glucose intolerance, dyslipidemia, oxidative stress, inflammation and fibrosis in [the] liver,” the researchers concluded. While they posited in their report that these benefits are due to the powder’s potent antioxidant activity, they suggest further studies to better understand its mechanism of action. It’s used to treat digestive disorders like diarrhea. Drinking the juice can boost digestive health. Applying Java plum juice to teeth can improve dental conditions. Fresh Java plum juice is beneficial to the immune system and helps with coughs and asthma. Java plums protect you from cold and act as an anti-aging agent. Learn more benefits of Java plums by following Food.news today.